The research presented here represents a segment of a cumulative impact assessment of resource development in northeastern British Columbia. It considers point and area source emissions of sulphur and nitrogen oxides (SO2 and NO x , respectively), over a 2,156-km2 area. With the exception of open burning, all emissions are from Upstream Oil and Gas (UOG) sector sources (SO2, n = 103; NO x , n = 250; area, n = 25). AERMOD View™ was used to estimate the maximum potential concentration and deposition of these pollutants over 1-h, 3-h, 24-h, and annual averaging periods. 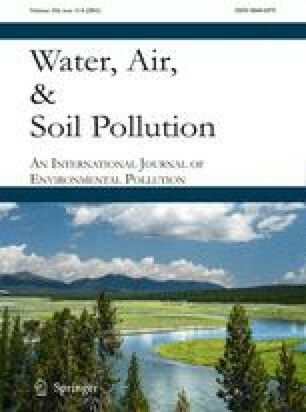 Results are compared with various thresholds and limits from the policy and scientific literature to assess the potential cumulative effects of these pollutants. Of the thresholds employed, exceedances of the 1-h and 24-h NO x concentrations and the annual SO2 concentration are predicted. There were no predicted exceedances of annual deposition thresholds (i.e., “Critical Loads”). Maximum predicted concentrations vary between compounds and are related to boundary layer stability, elevation, and distance from sources. Comparison with nearby monitoring data indicated that predicted concentrations were reasonable and that AERMOD provides a useful tool for approaching the potential cumulative impacts of air pollution from multiple sources. While the accuracy of Gaussian-based annual deposition estimates is questioned, model enhancements that could extend the application to more comprehensive assessments are suggested. Lastly, the implications of predicted threshold violations for forest ecosystems and local forest-dependent First Nations communities are discussed. Thanks to David Niemi and Roy McArthur of Environment Canada for providing emissions data, Michael Rensing BC Ministry of the Environment for providing CMAQ_ACE data, Judy Chow of the Desert Research Institute for guidance on particulate size fractions, Jason Redman of Lakes Environmental for outstanding technical support, Rob Kemp of Levelton Engineering and Peter Reid of Jaques Whitford for discussions on flare stack parameters, Wayne Boulton and Michael VanAltena of RWDI for their time and technical guidance, Roland Stull for sharing his wisdom on atmospheric processes, and John Innes for his support and helpful comments on the manuscript. BC Ministry of Energy, Mines and Petroleum Resources (2005a). Digital geology map of British Columbia, Release 1.0. http://www.empr.gov.bc.ca/Mining/Geoscience/PublicationsCatalogue/DigitalGeologyMaps/Pages/default.aspx Accessed 5 May 2009. BC Ministry of Environment (2008). Guidelines for air quality dispersion modelling in British Columbia. Environmental Protection Division, Environmental Quality Branch, Air Protection Section, Victoria BC. 148 pp. http://www.env.gov.bc.ca/air/airquality/pdfs/air_disp_model_08.pdf Accessed 29 January 2009. BC Ministry of the Environment (2009a). Air quality online. http://a100.gov.bc.ca/pub/aqiis/aqi.bulletin?group_name=PRINCE_GEORGE Accessed 13 September 2009. BC Ministry of Environment (2009b). Air quality objectives and standards. http://www.env.gov.bc.ca/air/airquality/pdfs/aqotable.pdf Accessed 19 July 2009. British Columbia (2007). The BC energy plan — A vision for clean energy leadership. Policy Actions, Oil and Gas: Policies 36–55. http://www.energyplan.gov.bc.ca/PDF/BC_Energy_Plan_Oil_and_Gas.pdf Accessed 2 November 2007. Canada (2007a). Notice with respect to substances in the National Pollutant Release Inventory for 2006 — Amendment. Part I: Criteria for Reporting Substances Listed in Part 2 of Schedule 1. Department of the Environment, published under section 71(1)(b) of the Canadian Environmental Protection Act. Canada Gazette 141(9). Ottawa, ON. March 3, 2007; available at http://canadagazette.gc.ca/archives/p1/2007/2007-03-03/pdf/g1-14109.pdf Accessed 12 April 2009. Canada (2007b). Canada Gazette. Notice with respect to reporting of information on air pollutants, greenhouse gases and other substances for the 2006 calendar year. Part I 141(9) Supplement: Department of the Environment, published under section 71(1)(b) of the Canadian Environmental Protection Act. Canada Gazette 141(49). Ottawa, ON. December 9, 2007; available at http://canadagazette.gc.ca/archives/p1/2007/2007-12-08/pdf/g1-14149.pdf Accessed 21 June 2008. CCME (2009). Regional strategic environmental assessment in Canada: Principles and guidance. Canadian Council of Ministers of the Environment, Winnipeg, MB. http://www.ccme.ca/ourwork/environment.html?category_id=135 Accessed 29 July 2009. Duhamel, R. (1966). Treaty No. 8. Made June 21, 1899, and Adhesions, Reports, Etc. Queen's Printer and Controller of Stationary, Ottawa. http://www.ainc-inac.gc.ca/al/hts/tgu/pubs/t8/trty8-eng.asp Accessed 12 June 2009. Environment Canada (2008). 2008 Facility & Substance Information for SPECTRA ENERGY TRANSMISSION — McMahon Gas Plant http://www.ec.gc.ca/pdb/websol/querysite/facility_substance_summary_e.cfm?opt_npri_id=0000004305&opt_report_year=2008 Accessed 10 March 2010. Environment Canada (2009). Alternative threshold framework modelling proposal for the National Pollutant Release Inventory. http://www.ec.gc.ca/inrp-npri/default.asp?lang=en&n=94856B00-1 Accessed 10 March 2009. Goward, T. (1999). The Lichens of British Columbia — Illustrated Keys — Part 2 — Fruticose Species. British Columbia Ministry of Forests Research Program, Special Report. 326 pp. Victoria, BC. http://www.for.gov.bc.ca/hfd/pubs/Docs/Srs/Srs09.pdf Accessed 28 August 2009. Legge, A. (1995). An environmentally significant flare event from a sour gas processing plant: Proposed quantitative definitions. Prepared for Westcoast Energy Inc. Biosphere Solutions. Calgary, Alberta. February 11, 1995. www.ogc.gov.bc.ca/documents/publications/reports/biosphere%20solutions.doc Accessed 29 July 2009. Massey, N. W. D., MacIntyre, D. G., Desjardins, P. J., & Cooney, R. T. (2005). Digital map of British Columbia: Tile N10 Northeast B.C., B.C. Ministry of Energy and Mines, Geofile 2005-10. http://www.empr.gov.bc.ca/Mining/Geoscience/PublicationsCatalogue/DigitalGeologyMaps/Pages/default.aspx Accessed 17 May 2009. Meteorological Service of Canada (2009). Daily Observation Data, Canada's National Climate Archive, Fort St. John. http://www.climate.weatheroffice.ec.gc.ca/climateData/hourlydata_e.html?timeframe=1&Prov=BC&StationID=1413&Year=2000&Month=1&Day=1 Accessed 15 January 2009. OGC (2008). Oil and Gas Commission of British Columbia. Member login, Data Download. https://quoll.ogc.gov.bc.ca/generic_ogc/Ext_Accnt.Logon Accessed 25 March 2008. Sander, R. (1999). Compilation of Henry's Law constants for inorganic and organic species of potential importance in environmental chemistry (version 3). http://www.mpchmainz.mpg.de/Bsander/res/henry.html Accessed 17 March 2009. Science Applications International Corporation (2004). EPA Spatial Allocator User Guide. William Benjey, Thomas Pierce, and Dan Loughlin. United States Environmental Protection Agency National Exposure Research Laboratory Office of Research and Development Research Triangle Park, North Carolina. 44 pp. http://www.ie.unc.edu/cempd/projects/mims/spatial/Spatial_Allocator_UG.pdf Accessed 2 March 2009. Soil Landscapes of Canada Working Group (2005). Soil Landscapes of Canada v3.0. Agriculture and Agri-Food Canada (digital map and database at 1:1 million scale). http://sis.agr.gc.ca/cansis/nsdb/slc/v3.0/intro.html Accessed 12 June 2008. UNECE-CLRTAP (2004). United Nations Economic Commission — Convention on long-range transboundary air pollution. Manual on methodologies and criteria for modelling and mapping critical loads and levels, and air pollution effects and trends, Berlin, Germany, 202 pp. http://icpmapping.org/cms/zeigeBereich/5/manual_und_downloads.html Accessed 11 June 2008. US-EPA (2004). AERMOD Deposition Algorithms — Science Document (Revised Draft). http://www.epa.gov/scram001/7thconf/aermod/aer_scid.pdf Accessed 12 July 2009.